In stock. Order in the next 8 hours, 1 minute and it will go out today! This is a terrific idea: we all know the Zig-Zag effect, of course. 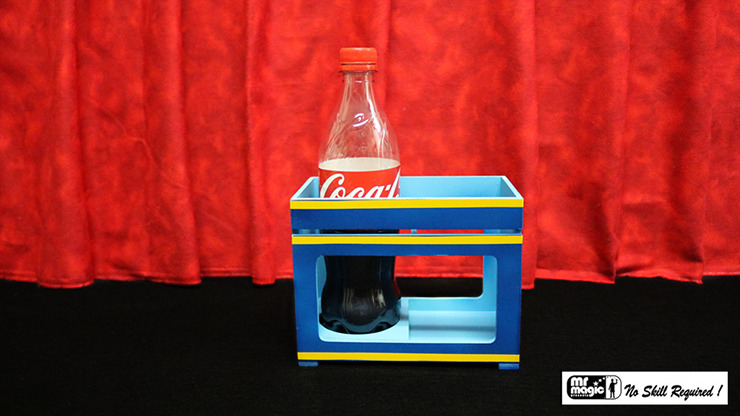 Now you can do it with a Coke Bottle that you use for other routines in your show! Sawing things in half is a classic magic effect. With the Mr. Magic Zig Zag Coke Bottle, no assistants are needed! The magician shows a full bottle of Coke and places it inside a plastic container that has the front and back removed so the audience can see right through it. The magician takes a plastic plate and seemingly dissects the bottle right in half with the liquid still inside!!! If that wasn't enough, the top of the bottle is able to be slid to the side in a Zig Zag pattern so it is clearly separated from the bottom. The magician then slides the bottle together and removes the whole bottle. As a final convincer, the magician can pour Coke from the bottle into a glass and drink it!